Tomorrow would be a jam-packed Saturday for me, Ayie and Jabe. a. DTap - The DTaP vaccine protects your child against three diseases: diphtheria, tetanus, and pertussis (whooping cough). c. IPV or Polio vaccine - The polio vaccine protects against poliomyelitis (polio), a highly infectious disease caused by a virus that invades the nervous system. 2. After his check-up we'll be heading straight to Rockwell Tent for the Mommy Mundo bazaar, this would be the first Mommy Mundo Bazaar I'll be attending. I am so excited to get my Mommy Mundo passport and my Mom 24/7 Planner. If you are interested, The Mommy Mundo Bazaar will be from tomorrow, 19 November until Sunday 20 November 2011 at the Rockwell tent. 3. Lunch and business meeting with mommy friends, that is, if we get to arrive at the Mommy Mundo Bazaar early, but if not, we will try our best to attend the business meeting before it ends and in time for us to proceed to our next destination. 4. 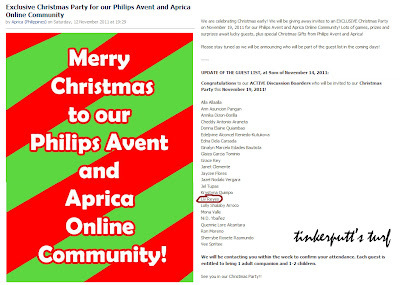 We will be attending the Exclusive Christmas Party sponsored by Philips (Avent) and Aprica Philippines. 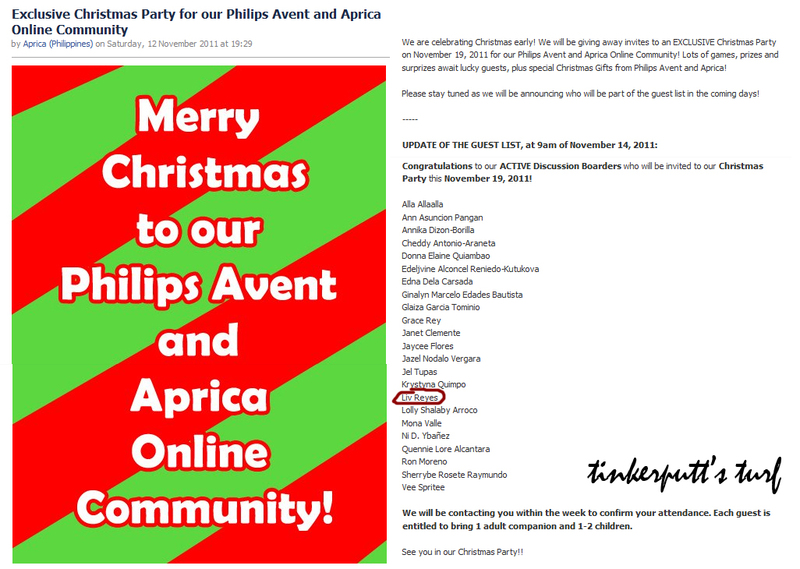 So happy to know that I have been invited and has been a part of their VIP guest list for 4 events already. This would be their Year-End Party and I think almost a Thank-You party for everyone who was active in their Discussion Board. The theme is Nutcracker and they said if it is possible to dress the babies and kids in relation to the theme, But due to time constraints, I was not able to look and buy a costume for Jabe :( I'll just let him wear his maong pants and long-sleeved shirt. Well, that's all for now! I stll have tons of pending work waiting to be finished before the end of the day so I can fully devote my time to Ayie and Jabe over the weekend.